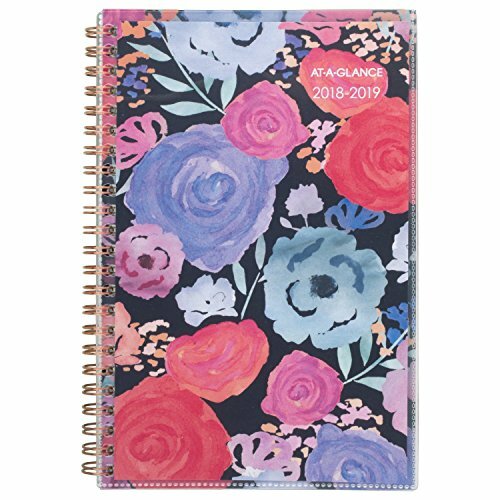 Midnight Rose design planner covers feature a stylish pink, purple and blue Rose Bloom design with Rose gold accents against a black background. Clear front sleeve allows customization - just insert your own cover page. 12 month date range covers academic Year July - June. Perfect for teachers, parents and others who plan in this time frame. One week per two page spreads have ruled planning space for each day. Tabbed, one month per two page spreads have unruled blocks, notes space and reference calendars. Special planning pages included. Paper resists ink bleed and contains a minimum of 30% post-consumer waste recycled material. Wirebound. 4-7/8" x 8". 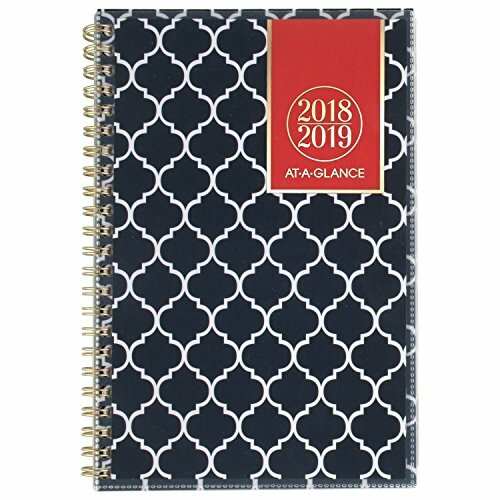 Emma Moroccan planner covers are a rich Navy color with white geometric design, but the clear front sleeve allows for customization. 12 month academic date range from July to June. One week per two page spreads with ruled space and an open block next to each day. Tabbed, one month per two page spreads with open blocks. Inspirational saying on each spread. Special pages included. Paper resists ink bleed and contains a minimum of 30% post-consumer waste recycled material. Gold wirebound. 4-7/8" x 8" page size.